There's nothing more satisfying than the taste of a cool refreshing bowl of ripe, sweet fruit salad. 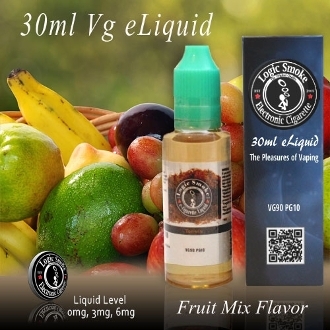 That's what you get from Logic Smoke Fruit Mix flavored e-liquid. With a slight overtone of honey dew melon, with hints of mixed berries, you'll fall in love with this yummy fruit explosion of flavor! Good as a stand alone vaping flavor or awesome to mix with just about anything. Add in some watermelon or peach. Jazz it up with grape or blackberry. You have several different Logic Smoke fruit flavors to choose from to customize this flavor to your liking. Try it today and happy vaping!